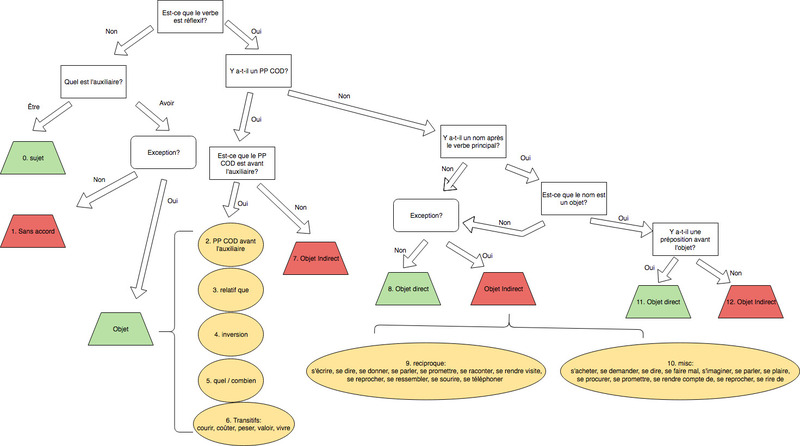 I have some difficulties grokking this subject, after reading a lot here and other sites, I've tried to create a flow chart that summarizes all the different cases, so it can be used by French language students or even a computer program. Is it correct? Are there any mistakes or inaccuracies? Is it complete? Are there any cases not covered here? How can it be simplified? Is it necessary to learn the verbs in (10) by heart? What exactly do they have in common? Yes, it can certainly be simplified! Here's my attempt and link to LucidChart doc (requires login). Having taught this to elementary and high school students for a few years now, I've boiled it down to two rules that do need some explanation but are easy to remember once they're understood. * The only verbs that should be memorized by heart for this purpose. As long as students understand a few basic terms, these rules are pretty clear. "être by default" means that a verb whose auxiliary becomes être because it's reflexive doesn't automatically count. It may still count because of the second rule, but not just because it's être. This rule refers to verbs like tomber that naturally take être. "direct or indirect reflexive objects" means you can't tell just by looking at the reflexive object. Test using the verb's infinitive: does it take an indirect object, i.e. does it use à ? Since some verbs only seem to appear in the reflexive form (se méfier de), it might be impossible to recast the reflexive object postverbally. The source you cite says these are all going to function like direct objects, i.e. trigger agreement, and I believe that's right. Don't forget that some sentences have two objects. Make sure you agree with the direct one. As-tu envoyé la lettre à Jean ? — Oui, je la lui ai envoyée. For starters, your graph is treating "verb" and "auxiliary" as the same thing ("Quel est le verbe" ought to be "quel est l'auxiliaire"). They are not and this makes your graph confusing to people trying to explain. In fact, because of this, I cannot even tell what distinction "y a-t-il un nom après le verbe" is trying to make since I can't tell if you're referring to auxiliaries while simultaneously managing to confused nouns and pronouns (the latters of which would be before the auxiliary), or referring to actual nouns being after the entire verb. 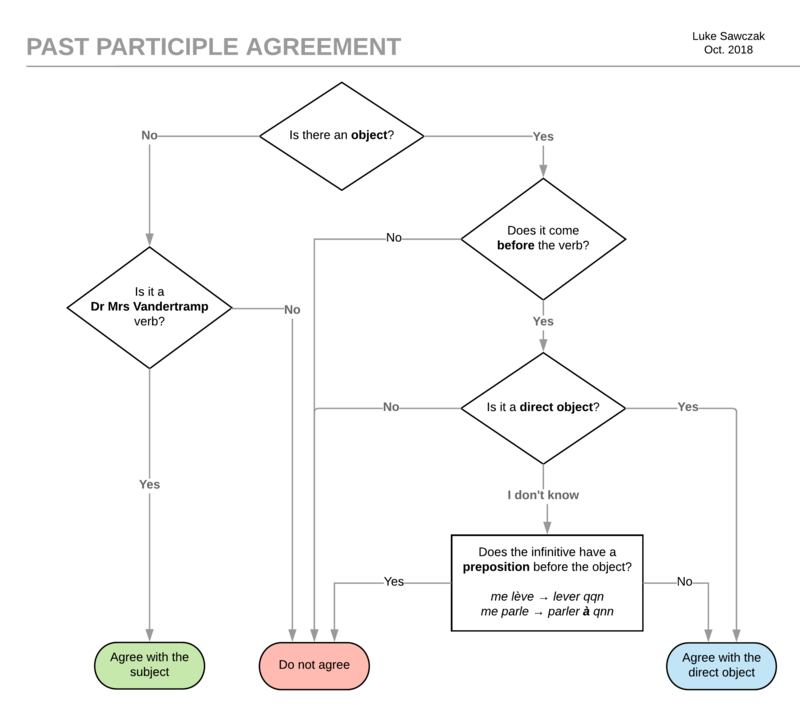 For a preliminary version of a diagram flow, it is rather good. Linguistically it needs some effort to be a proper one. Others will certainly point out several things. There are also some verbs that they are conjugated with avoir if they have a direct object. Sortir (J'ai sorti les poubelles. Je suis sorti avant lui. ), Monter, Retourner, Descendre, Passer, Rentrer. Not the answer you're looking for? Browse other questions tagged grammaire accord participe-passé passé-composé or ask your own question. When to add feminine verb endings (accord du participe passé) ?